The Hamilton Comic Com was held in downtown Oakville (or so it seemed trying to drive around our own Downtown). First, the native Canadians chose to hold a BBQ at the Main & James intersection; the cops were there detouring traffic. I was sympathetic to their cause, alas; my empathy ‘went up in smoke’. As for the event; I loved it and had a ball. Met a couple of idols from my youth and felt utterly safe considering the myriad Batmen; Supermen; Spidermen and especially the Wonderwomen, not counting the ones that were behind the various counters or booths. Seems that just like in “Big Bang Theory”, attendance in costume is de rigeuer and in talking to a number of attendees, dressing up is fun; helps make the occasion an event, and is a ‘super’ way of socially ice-breaking. The conference’s general manager is Chris Dabrowski and he is so pleased with the reception that Hamilton gives to this event; he promises that it will become an annual tradition for the 1st weekend of October. Here’s an exclusive – he and his team are even considering making it a two-day affair in 2015! This scribe had the opportunity (along with the other 8,000 attendees) to see the Bat Mobile; try my expertise at recognizing a number of miniature Ghost houses from TV or the movies. (‘Truth – only guessed one – from The Addams Family). Stood miniscully next to Lou ‘The Hulk’ Ferrigno; and explored a plethora of pre-Halloween costume prospects. I also noticed that all the comic heroines or villainesses have figures to die for. Speaking of which, spent some time with the ultimate Catwoman – Julie Newmar whose ‘Stupyfying Jones’ [from “l’il Abner”] poster decorated my teen-aged bedroom. Additionally we chatted about her in “Seven Brides for Seven Brothers” she was in with an old U.S. college acquaintance of mine…Rusty Tamblyn. 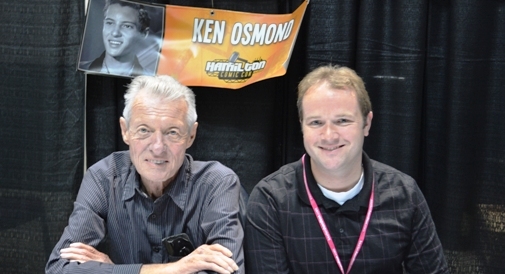 A big treat was meeting Ken Osmond. He played ‘Eddie Haskell’ the trouble-maker on ‘Leave it to Beaver’. I always identified with him as my old friends would agree because most of the mischief that my gang got into was instigated by yours truly. There were two things that were slightly problematic; the first was separating displayers from attendees; and the 2nd was a concern about how some of the intricately or elaborately costumed folk managed to pee! Actually had a coterie of people detailing their own methodology to me. It may not be classic music or professional theatre, but it is a culture and one this writer will no longer denigrate. It was fun, and I was especially taken with a tee-shirt in the Star Trek booth that proclaimed “SHAT HAPPENS”. Take that; cousin Willy.